In vino veritas, right? During a recent team gathering in Kraków, Poland, and after several yummy bottles of țuică, vișinată, żubrówka, diluted with some beer, the truth came out – even though we run Logsene, a log management service that you can think of as hosted ELK Stack, some of us still ssh into machines and grep logs! Whaaaaat!? What happened to eating our own dog food!? It turns out it’s still nice to be able to grep through logs, pipe to awk, sed, and friends. But that’s broken or at least inefficient — what do you do when you run multiple machines in a cluster of have several clusters? Kind of hard to grep all them logs, isn’t it? In the new world of containers this is considered an anti-pattern! We can do better! We can fix that! 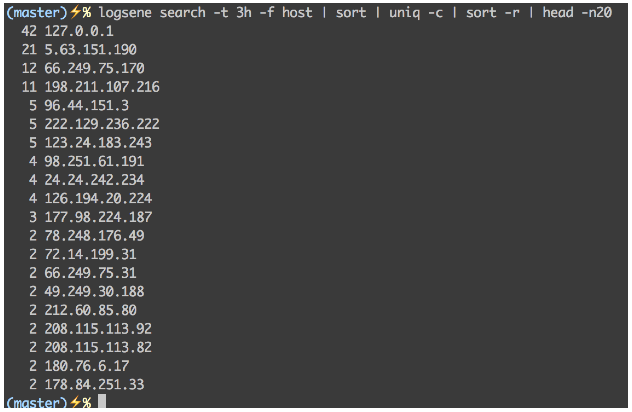 have a powerful command-line log search tool you can combine with your favorite Linux tools: awk, grep, cut, sed, sort, head, tail, less, etc. Logsene CLI is a Node.js app written by a self-proclaimed Node fanboy who, through coding Logsene CLI, became a real Node man and in the process grew a beard. The source code can be found on GitHub. See those two large input fields in the figure above — one for search query and the other for time range? Well, information that you’d normally enter via those fields is what Logsene CLI lets you enter, but from our beloved console. Let’s have a look. Let’s start with a basic example using Web server logs. Note that the default size limit is always in effect, unless explicitly changed in the configuration, like we just did. When set like this, in the configuration, the –default-size setting applies to the remainder of the current Logsene CLI session (times out after 30 minutes of inactivity). The other option is to use the -s parameter on a per-command basis, which works the same way, you either specify the maximum number of returned results or you just use -s without a quantifier to disable the limit altogether. There – with this one-liner you can see the average response size across all your web servers is 5557.1 bytes. We’ve used Web access log for examples so far, but you can certainly send any logs/events to Logsene and search them. In the next example we search for logs that contain either or both phrases we specified and that were created between last Sunday morning and now. Note that the “morning” part of the -t switch below translates to 06:00 (using whichever timezone your Logsene CLI is running in). Let’s also return up to 300 results, instead of the default 200. Note how this does an OR query by default. Alternatively, you can use the -op AND switch to match only those logs that contain all given keywords or phrases. When searching through logs, it’s important to have a fine-grained time filtering capability. Here’s a quick rundown through a few ways to specify time filters. Note: when you specify time without a timezone Logsene CLI uses the timezone of the computer it’s running on. If you want to use UTC, all you need to do is append Z to a timestamp (e.g. 2015-06-30T16:50:00Z). The next five commands show how to specify time ranges with the -t parameter. Logsene CLI recognizes ranges by examining whether the -t parameter value contains the forward slash character (ISO-8601). Minutes are used by default, so you can just omit m.
You can try Logsene CLI even if you don’t already have Sematext account. Opening a free, 30-day trial account is super simple. You’ll be set in less than 15 minutes to start playing with Logsene CLI. We won’t ask you for your credit card information (it’s not needed for a trial account, so why would we?). Try it! The Logsene CLI source code can be found on GitHub. Please ping us back with your impressions, comments, suggestions, … anything really. You can also reach us on Twitter @sematext, or the old-fashioned way, using e-mail. And we would be exceptionally happy if you filed an issue or submitted a pull request on GitHub. Enjoy!